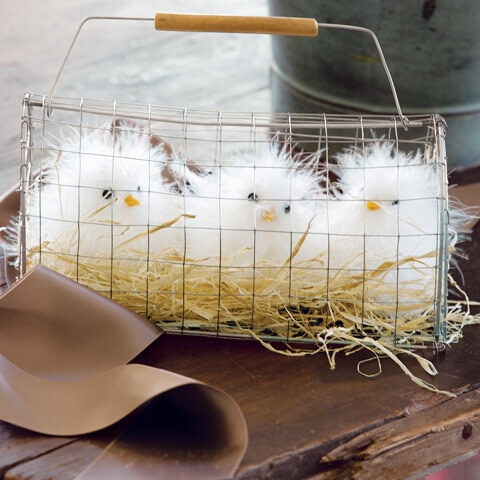 With downy white feathers and inquisitive little eyes, this charming trio will add a unique touch of fresh spring whimsy to any décor. Nested together in a rustic wire crate measuring 9 ½" x 5" x 10 ½" to top of handle, Three Little Chicks set comes gift wrapped in a hand crafted wood crate with ribbon. Three Little Chicks is rated 4.6 out of 5 by 23. Rated 5 out of 5 by Vicks from Three little chicks! 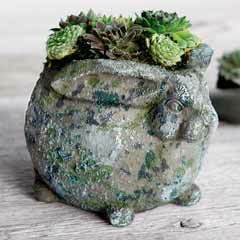 I bought this for a couple with young twins and a new baby, and they love it! Rated 5 out of 5 by Vitanuova from Happy Easter! 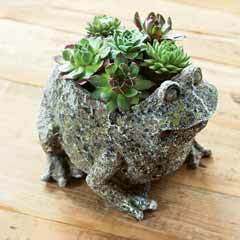 I bought this for my mother to decorate her new apartment for Easter. The chicks are adorable and just as pictured in the catalog. Very cheerful! Rated 3 out of 5 by leela from Precious! Appropriate for Children I purchased three of these, two as gifts and one for myself. The wooden box these came in provided more value (for my money) than the precious styrofoam based chicks. Rated 5 out of 5 by My Girl from A Uplifting Gift for a Friend My dear friend lost the dog that she found as a stray on the road outside Prescott, Arizona many years ago. When he died, she vowed that she would never get another dog since it was too painful for her.. So, I bought the Three Little Chicks featured above to become her pets. It restored her sense of humor and we both laughed when they arrived at her home! Thank you, Olivia & Cocoa! Rated 1 out of 5 by Lucybelle from Terrible disappointment I think I paid for fabulous packing. Little chicks covered in straw. Opened end and could not pull out to uncover all the eyes so no one could tell what they were. 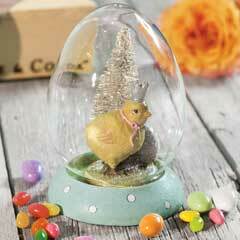 Rated 5 out of 5 by Barb123 from Sweetest gift I sent this gift to a friend for Easter and received a glowing thanks- cutest ever! Rated 5 out of 5 by Chaka1 from Realistic Bought these for my 10 year old daughter. She absolutely loved them. Packaging was stellar and arrived as scheduled.